(New York – July 21, 2017) This morning, GRAMMY® Award winner Cage The Elephant debuts a reimagined and stripped down version of their song “Rubber Ball,” featured on their forthcoming album UNPEELED. Click Here to listen to “Rubber Ball.” The song, which originally appeared on the Cage The Elephant’s 2011 album Thank You, Happy Birthday, was recorded live at their sold-out, hometown show at Nashville’s Ryman Auditorium, and you can listen to it here. 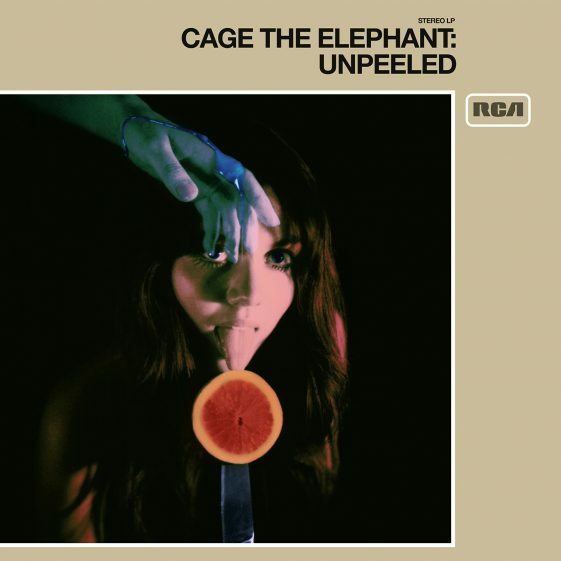 Cage The Elephant will release UNPEELED worldwide on July 28th via RCA Records. The new album was recorded over a series of intimate shows in cities including Los Angeles, Washington DC, Knoxville, and Nashville where the band performed in a stripped-down arrangement with a string quartet and additional percussion. UNPEELED features twenty-one tracks: eighteen curated songs from their past four albums plus three reimagined versions of existing songs. Said front man Matt Shultz about the inspiration behind the album: “Many times you’re adding sonic layers looking for something to hide behind, and what you don’t realize is that that vulnerability and that nakedness might be the most compelling and interesting thing about the song.” Preorder the album here. Cage The Elephant previously premiered their music video for “Whole Wide World,” featured on UNPEELED, on Consequence Of Sound. Recently, Cage The Elephant also appeared on Late Night With Seth Meyers to perform the UNPEELED versions of “Whole Wide World” and “Too Late to Say Goodbye”. Cage The Elephant has a number of confirmed festival dates in the US and will perform at Forecastle Festival, Lollapalooza, Osheaga Music & Arts, Mempho Fest and Cal Jam with The Foo Fighters and Queens of the Stone Age. Tickets for these dates are on-sale now and available here. Cage The Elephant received their first GRAMMY® AWARD for Best Rock Album for their fourth studio album, Tell Me I’m Pretty, which was produced by Dan Auerbach of The Black Keys. At radio, Cage The Elephant holds the record for the most #1 Alternative songs of any artist this decade. Tell Me I’m Pretty’s first two singles “Mess Around” and “Trouble,” both topped the Alternative charts at #1 (“Mess Around” also hit #1 at Triple A). In addition, “Trouble” maintained its bullet on the Alternative radio chart for an astounding 41 weeks. “Cold Cold Cold,” went top 5 at both Alternative and Triple A. Watch the video for “Cold Cold Cold” and “Trouble,” both directed by singer Matt Shultz.